We live in a time where it has seemingly become taboo for Christians to say what believers should or should not do. People are afraid to tell the truth. So now what we have is a bunch of folks walking ‘round claiming to be good Christians who have no decorum and no discipline in what they do, say, find funny, watch etc… And they believe themselves right with God. Of course we never want to disappoint others, but I must tell you something. 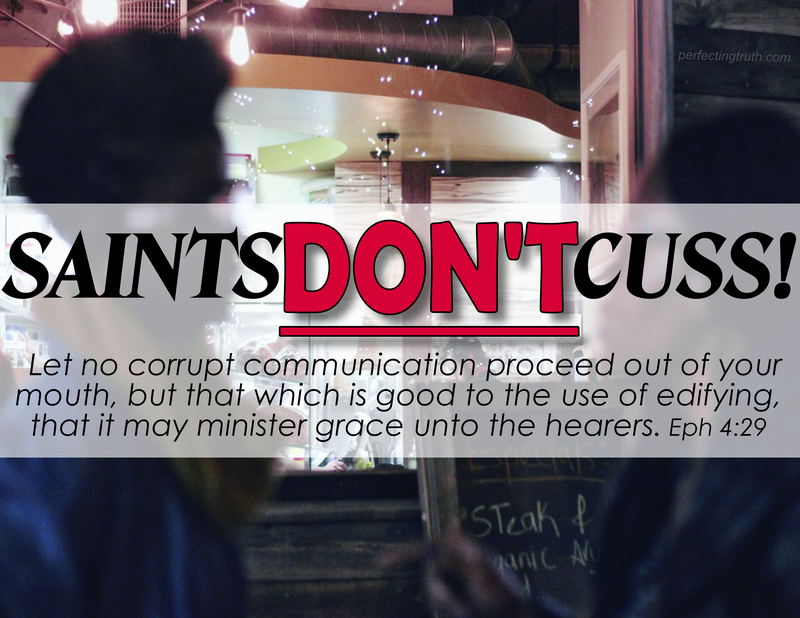 SAINTS DON’T CUSS. Contrary to popular belief, there are indeed things that real saints do not do. And, newsflash, there is no amount of Scripture twisting that is going to make this stuff ok. There are more and more professing Christians using profanity – just look at some of the social media posts out there; some even try to excuse it because they were upset or some such nonsense. Whether we want to acknowledge it or not, true believers have a filter. Instead, these days, it seems many claiming Christ must have thrown their filters away, opting to say, watch, read, and do anything while still claiming to belong to Christ. This is not right, and God is not pleased. People love to say what holiness is not while ignoring what holiness is. Church folks love to take pot shots at those who’ve gone before, considering themselves to be more knowledgeable than those who may have had less education but possessed true hearts for God. Holiness includes lifestyle. The fact remains that God commands His people (from today as well as yesterday) to be separate, different; to keep ourselves unspotted from this world. We cannot do that without true repentance and a dogged refusal to return to those worldly – flesh appealing – ways. The enemy’s purpose is to pull us away from God, so he throws seemingly innocent distractions in our path. As we give in to them we move further from God, one easy step at a time. It is often such a subtle process that, although some around us will begin to notice the change, we often never personally recognize/acknowedge it until it’s too late. Fred fails to realize that God delivers, but it is our choice to return to the prison of our old man. For Fred the enemy uses old friends to start the ball rolling. For some it could be too much “innocent” time before the one-eyed monster; or anything else that can causes us to leave an area of our lives unguarded. I encourage all of us to HEED THE WORD OF GOD, which tells us that evil company corrupts good habits (1 Cor 15:33 NKJV). If we are going with God we must be willing to make the difficult choices to cut some associations, to stop certain things. We have to value our salvation, the peace and joy of the Lord, enough to guard our steps. If not, we will always make 2 steps forward and 4 back in our effort to walk with God. I pray that we all wake up to this truth before it’s too late. Check out what David Wilkerson had to say on the subject of friendship and the believer. As believers we must stop putting up with and making excuses for sin in our lives. Those small things, those things we “think” so insignificant are still sin in the eyes of God, and we cannot turn a blind eye to them. I encourage all of us today; let’s train our minds, hearts, eyes, ears and mouths for righteousness. Develop your taste for those things that are right and pleasing to God. Amen! You are so right. When I made a commitment to follow Christ at the age of 23, God helped me clean up my foul mouth. We should not be in the business of convincing people we are not followers of Christ. Peter was accused twice of being a follower of Christ by the way he spoke. The third time he was accused, he started cussing to convince them that he wasn’t a follower of Christ. Thanks for reading and commenting on the post. I love your statement that, “we should not be in the business of convincing people we are not followers of Christ.” Thank you!! It seems more and more professing believers don’t want to be too closely associated with the One they claim to serve. What was that Jesus said about those who are ashamed of Him? It would behoove us never to forget that promise. Wonderful point you made regarding Peter. It is no coincidence that he started cussing in an effort to prove He wasn’t a believer. Our words and actions matter. We can claim to be members of The Way, but it will be proven by the life we live. About this sentence: “I’m not perfect I’m just forgiven,” is often just a dodge used by many who are not living according to the standards of God. Many of those who say this truly it because they either listen to, or attend a church with false preachers in the pulpit who never encourage their congregation to study their Bibles, because they don’t want the people to know they are worldly, not Godly, preachers. Evangelicals are a huge group (some of them excluded) who have gone to a Bible College and learned how to preach and take in offerings, however, they have not gone to a Theological Bible College to learn and understand the the history of what happened in the Old Testament, and fully understand why Jesus is the only means of Salvation and the extent of Old Testament failures that God knew would happen. a particular Scripture from the root word (Hebrew, Greek, Aramaic) and understand why it can be difficult to make a determination. People tend to believe there first existing encounter with Jesus in (whichever) church is accurate because that is what they were taught. But, they have never been challenged to follow 1 John 4:1 to “Test all spirits to see if they come from God, or the world “. That is something they may feel uncomfortable doing because they have made friends in that church. When did America stop wanting to know what God said, in lieu of what an author said for formal Bible Study? The books are fine for articles that can lead the lost to God or gain strength during difficulties; however, where would we be today had Jesus allowed his disciples to determine what they needed to know instead of listening to what he was teaching? I can’t help but think letting the followers lead is a huge part of why “love has grown cold” leading to the last days and why Atheists know the Bible more accurately than many Christians in America today. After all, Satan tried to trick Jesus with Old Testament scripture for 40 days, it should come as no surprise his demons are here to trick the saved and unsaved. You are right. I went to seminary. Going in, however, I already knew that the Word of God had precedence over it all. I had already been informed that if you are not careful theological schools can mess you up. I was not about to let that happen so went prepared. (I went to Liberty and did not have to battle errant instruction, so I was blessed. I know some who went to other schools and changed.) We can’t just take the words of infallible man and place them above the Word and will of God. This has happened too much, and it is one of the reasons we see the foolishness we do in churches nowadays. We forget that Jesus said to lift HIM up and He will draw. Instead we lift up programs, personalities and plans…sitting the Word to the side in order to fill pews and offering plates. It saddens me that so many allow the desires of people take precedence over the commands of God. I have watched pastors for whom the will of the people is law in the “house of god.” I have learned that it is not enough to trust the thoughts of infallible man when it comes to what pleases God. We have to go to the source by reading God’s Word and communicating with Him. If we could get all professing believers to do that it would transform churches, communities, and our nation. I think we don’t actually grasp the seriousness of actually staying ready. The saints of old did; however, today we have become bogged down with the cares of this world, and it has clouded our view and skewed our judgment. Thank you for reading and commenting on the post. God bless you! We live in the world but are not of the world. It is not popular to be religious in this day and age. What we say and do is so important; our choices can make or break us.